Most of the new information we got from the Disney Parks Blog comes in the form of back story. We already knew that each Marvel themed area at the various Disney parks was designed to work like a local Avengers outpost for the education and training of new recruits. This will include, at both Disneyland Resort and Disneyland Paris, the creation of the Worldwide Engineering Brigade (or WEB, because Spider-pun) by Tony Stark. 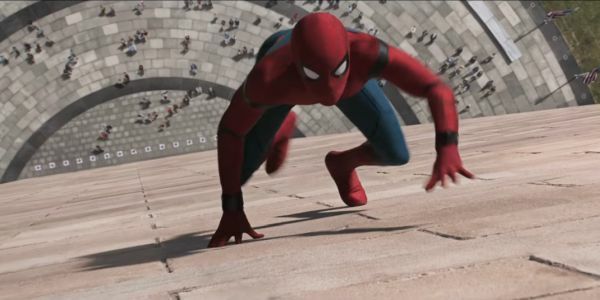 The purpose of WEB is to develop advancements in super powered technology, and the first assignment that WEB has been tasked with is creating new enhancements for Spider-Man’s suit. It’s not clear what these new enhancements will be, but if they’re truly “new” then we’re talking about seeing Spider-Man with powers that we haven’t seen him use in the Marvel Cinematic Universe, or potentially even in the comics. Of course, it’s also made clear that the goal of the attraction is to let guests engage with the superheroes and the super powers, so get ready to use these new abilities yourself. In addition to the new attraction, Disney also revealed that a new walk around character for Spider-Man is coming to the parks who will be dressed in an original costume. The new design was created by Marvel Studios’ Head of Visual Development Ryan Meinerding. One of the questions I’ve had about the new Marvel land from the beginning was in what ways, if any, it would be connected to the Marvel Cinematic Universe. The one existing Marvel attraction at Disney California Adventure, Guardians of the Galaxy – Mission: Breakout, uses the cast of the films and the new Ant-Man and the Wasp attraction at Disneyland Hong Kong does the same. However, that doesn’t necessarily mean these two parts of Marvel are connected. putting Spider-Man in an entirely originally designed costume in the parks would seem to indicate a separation between the two worlds. That doesn’t mean Tom Holland won’t appear in the attraction, we don’t know that for sure one way or another, but making the theme park universe it’s own thing certainly opens things up and gives the storytellers more options. This is the exact opposite idea of Star Wars: Galaxy’s Edge, where it has been made clear the events that take place within the new land are as much canon as anything that happens in the movies.